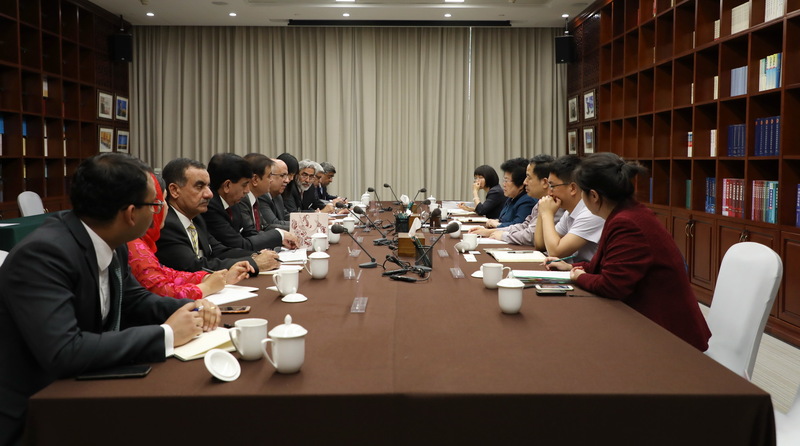 On the morning of May 7th, CCIEE Chief Economist Chen Wenling met with the delegation of Pakistan National Public Policy Institute, led by Dr. Shujat Ali, Secretary of the Pakistani Government and Director of the National Policy Management Department of the Pakistan National Public Policy Institute. Xu Zhanchen, Director of the Strategic Research Department at CCIEE, was also present at the meeting. Chen Wenling briefed the delegation on the six major strategies that China has gradually adopted since 1978, including the “reform and opening up”, “building a moderately prosperous society”, “innovation strategy”, “internationalization”, and “a modern national governance system”. She explained that these strategies are designed according to the needs of China’s economic development. At the very beginning, China’s top priority was to feed the population of 1.39 billion people, then it needs to develop its technology and even become a leader in some of the fields and now, the challenging facing China now is to transform China’s economy from high-speed economic growth to high-quality growth. Moreover, Chen Wenling introduced the building of the Belt and Road Initiative and the current economic relations between China and the United States. Dr. Shujat Ali said that the members of the delegation come from different ministries of Pakistan and the visit to China is part of a senior officials training program. This visit helps the delegates to learn from China’s advanced concept of governing the country. Through the exchanges with CCIEE, the delegation will bring China’s successful experience back to home and use it as a valuable reference for designing economic development strategies in the future. The two sides expressed their willingness to continue to work together for an equal, mutual beneficiary and friendly relations between China and Pakistan.